Spike analysis software for computing raster plots, peristimulus time (PST) histogram and inter-spike-interval (ISI) histogram. Spike occurrences are determined by a y-threshold level detector on positive or negative slope deflections. Set the Threshold crossing level that best suits your data. Use NeuroMatic’s Wave Increment Controls (3) to step through your data waves. The number of spikes detected and rate is displayed on the panel. Use NeuroMatic’s Channel & Wave Select Controls (7) to select the channel (e.g. “A”) and set of waves you wish to analyze (e.g. “All” or “Set1” or “Group0”). Select the All Waves button. Results are saved to Spike Waves, displayed in a raster plot. Use the Spike Analysis controls to compute averages and histograms. Download the Spike Tab Igor experiment demo. Channel Graph Transform – if you wish to compute spike-threshold crossings on differentiated or double-differentiated data waves, click the Transform checkbox on the currently selected Channel Graph and choose the desired function. Threshold – set the absolute y-threshold crossing level. Spike occurrences are determined by a y-threshold level detector (see Igor Pro’s FindLevels function) for only those values on a positive or negative slope deflection. Detected spike threshold crossings will appear as red ticks in the Channel Graph. xbgn, xend – set the x-axis spike detection window, or use your mouse to drag the red vertical Stats Drag Waves displayed in the currently selected Channel Graph. Enter -inf, inf to search the entire data wave. auto – turn on/off NeuroMatic’s automatic spike detection. All Waves – compute spike detection on all currently selected channels and waves (7). Results are saved to Spike Waves, displayed in a raster plot. 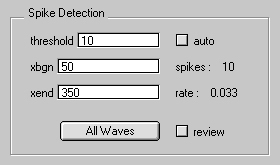 >> review – click this checkbox to review the spike detection results after selecting All Waves. Detected spike threshold crossings will appear as blue ticks in the Channel Graph. To delete unwanted spike times from the currently selected raster, draw a square marquee around unwanted spikes in the Channel Graph (blue ticks), click inside the marquee and select NM Delete Spikes From Raster. 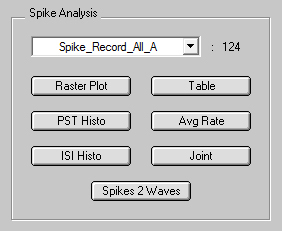 Folder Select – choose a Spike Subfolder to analyze, or a Spike Raster x-wave. The number of spikes appears to the right. Raster Plots – create a raster plot of the currently selected x-y raster waves. PST Histo – compute a peristimulus time histogram of the currently selected x-y raster waves. ISI Histo – compute an inter-spike-interval histogram of the currently selected x-y raster waves. Table – create a table of Spike Waves, including raster, PST and ISI histogram waves. Avg Rate – compute the average rate of the currently selected x-y raster waves. Joint – compute joint PST and ISI histograms. Spikes 2 Waves – copy individual spikes to new waves, beginning with prefix “SP_Rstr”. The prefix name will automatically be added to NeuroMatic’s Wave Prefix List. Select the appropriate spike prefix to analyze the individual spikes. >> Spike Waves are now created inside Subfolders by default. Spike Raster Waves are created with the following name convention: “SP_R” + X/Y + Wave Select String + Channel + Overwrite Sequence Number (i.e. “SP_RX_RAll_A0”). X-waves (“SP_RX...”) contain the raster spike times. Y-waves (“SP_RY...”) contain the data wave number from which spike times were derived. These waves are used to create raster plots. 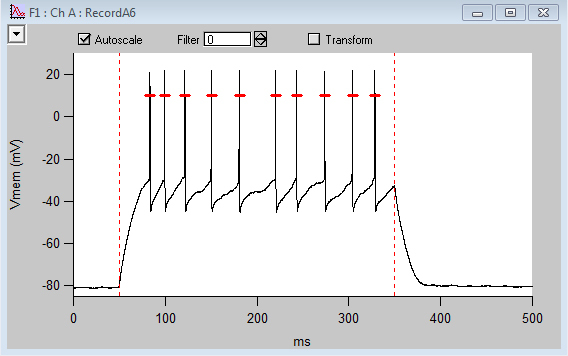 A NeuroMatic Channel Graph showing the membrane potential of a cerebellar granule cell in response to a 300-ms current step to 12 pA starting at 50 ms. Red ticks denote detected spikes. 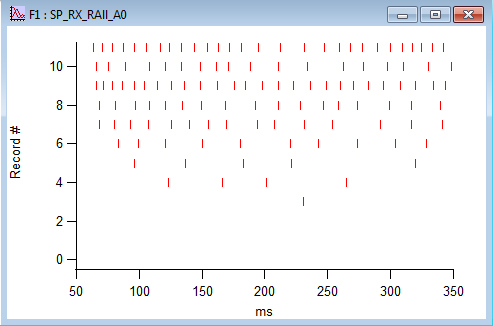 Drag waves (vertical dashed red lines) were used to set the time limit parameters xbgn and xend. Threshold was set to 10 mV. This Spike Raster Plot was created by NeuroMatic after selecting the “All Waves” button for the same data file shown in the above Channel Graph, consisting of 12 current-clamp recordings (300 ms current steps from -12 to +32 pA, increments of 4 pA). The XY-Paired Spike Waves used to create this plot are named “SP_RX_RAll_A0” and “SP_RX_RAll_A0”, which reside in a Spike Subfolder called “Spike_Record_All_A”.